March is Youth Science Month in Canada, a time when children all over the country begin seeking creative ideas for projects, experiments and demonstrations to display at science fairs and festivals. At school or at home, it’s the perfect month to celebrate science, and for children to explore science concepts. All they need is some simple and fun ideas to get started. Celebrate science with your kids this month. A terrific and timely idea for a science project is one that demonstrates a form of energy. A wind meter built from simple supplies such as Dixie cups and straws will demonstrate the speed and power of the wind and show how wind turbines work. Your children may also be interested to know they can make their very own homemade battery using coins, dish soap, vinegar and salt! It’s always fun for kids to play with their food! Why not try learning about the integrity of structures by building a tower of pasta — all you need is the pasta, white glue and weigh scales. If your child has a couple of weeks to invest in his or her science project, try experimenting to find out how packaging affects the ripening of fruit. So interesting! After Junior is done drinking his milk, reuse the container to design a milk carton boat, building and testing various designs. Perhaps the kids would like to experiment on the family’s breakfast cereals. This cool science project will demonstrate how to extract and measure the amount of iron in cereals. As a bonus, they get to use the blender! 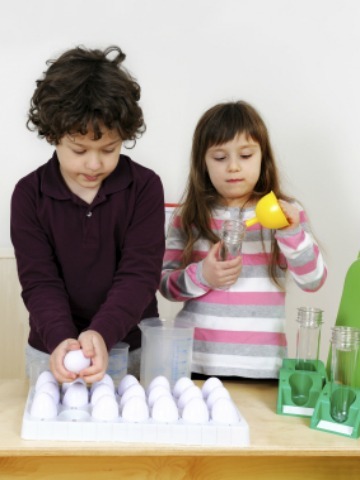 For many children, chemistry offers the most exciting type of science activity. Even parents will fondly recall their own papier-mâché volcanoes with “lava” pouring realistically down the sides. A simple but cool science idea is experimenting with bubble solutions by adding glycerin or corn syrup to a detergent-and-water mixture. For some fizzy fun, have the kids conduct an investigation on the chemical reactions of various-sized Alka-Seltzer tablets! Perhaps your child would like to try growing their own crystals with ice — this one requires adult supervision, but is really interesting, as the crystals will grow to different sizes depending on temperature. Strictly for the fun of it, your younger kids will enjoy making their own sidewalk chalk. This teaches the concepts of evaporation and filtering, but most importantly, it can be made in lots of crazy colours and used for springtime outdoor creative play! Science fair projects: Should parents help?